Heat exchangers are totally necessary in the refrigeration cycle: as shown in the diagram below, two out of the four basic steps in the refrigerant cycle are heat exchangers! Their operation affects greatly to the overall plant efficiency, so their maintenance is very important. Heat exchangers, like pressure vessels, are classified as static equipment as they don’t have any moving parts. They don’t require too much maintenance, but it is important to make visual inspections to detect leaks or corrosion and control its efficiency as it can decrease with time due to fouling. An ideal refrigerant system consists on one compressor, one condenser, one expansion valve and one evaporator. Condenser and evaporator are both of them heat exchangers. In the evaporator the refrigerant absorbs the heat of the water so it is chilled. In the condenser the refrigerant rejects that heat and the compressor heat to other media, usually air or water. There are many types of heat exchangers. However, in this post we will focus on shell & tube and plate heat exchangers. These are two of the most used types of heat exchangers in refrigeration plants. A plate heat exchanger consists of a series of plates with a small separation between them with the hot fluid and the cold fluid between those spaces. Heat is transferred through the plates: the area, the thickness, the shape, the roughness and the material of the plates affect its capacity to transfer heat between the fluids. A shell & tube heat exchanger consist of a pressure shell with tubes inside. One of the fluids is contained in the tubes and the other fluid is contained in the shell. The heat is exchanged trough the tube walls. As in the plate heat exchanger, the characteristics of the pipe wall have an impact in the heat transfer rate. In both of them, the efficiency is related directly to fouling. Fouling could be defined as the accumulation of deposits in the heat exchanger surfaces. There are many causes of this: scaling, biological, suspended particles in the fluids… This accumulation produces a loss of heat transfer, reducing its efficiency and, in the case of a refrigerant plant, reducing the overall plant efficiency. Also fouling can increase the head loss due to the reduction of the water section pass. This process is unavoidable. With time every heat transfer system will see a reduction on his efficiency, but cleaning the surfaces will revert the heat exchanger to its original efficiency. The velocity of the fouling process depends mainly on the characteristics of the fluid used: fouling will not be the same using treated water than using sea-water: the second one will carry more particles and biological contamination. During design of the heat exchanger a fouling factor is provided to ensure that the heat exchanger can work during certain time at design conditions, but after some time fouling will increase and a cleaning operation will be required. The fouling factor used in design will increase the initial cost of the equipment as this fouling factor is translated in an increase of the heat transfer area. An overstated fouling factor increases the heat exchanger initial cost and substated fouling factor increases the maintenance and operation costs during its life, so it is important to set he correct fouling factor during design. Depending on the type of fouling there are different methods to solve it. All of them have the same purpose: to clean the surfaces of the heat exchangers. Heat exchanger cleaning supposes a costly maintenance time and depending on the installations also means the shutdown of the plant. So every investment in the reduction of the number of these maintenance operations along the time will be profitable. There are many ways to reduce the fouling problem that can be divided in two types: off line and in line. Off line methods consist on stopping the heat exchanger service and dismount and clean the surfaces directly. There are many methods used: manual cleaning, jet cleaning, blasting… These methods are simple but require stopping the plant. They suppose a cost during the operation of the plant. On the other hand, in line methods don’t require the stop of the plant. These methods are applied during operation and we can find upstream filtration, back flushing, flow excursion… These methods increase the initial cost of the plant but avoid plant shutdowns and reduce the maintenance costs of the plant. Heat exchangers are really important equipment in a district cooling plant. Their efficiency have a great impact in the efficiency of the overall plant. Monitoring this efficiency it can be scheduled a cleaning procedure in order to recover full heat transfer capabilities of the heat exchanger. There are many types of fouling, depending on the characteristics of the fluids used in the process. Usually refrigerant side will be cleaner than secondary circuit that usually uses water with different type of compositions, which will increase fouling over time. There are two main ways to avoid fouling: off line methods and in line methods. Off line methods have bigger maintenance costs during plant life and in line methods increase the initial cost of the plant. A study shall be made to considerer the best option depending on the parameters of the plant. 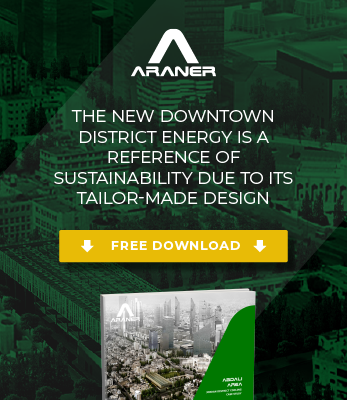 At ARANER our experts analyze individually the necessities of each District Cooling Plant in order to suggest the best solution. We want to hear from you! Get in touch and we will help you to optimize the efficiency of your DC Plant in time. A very brief, structured and interesting article! This reflects the high knowledge of the team to give such simple and understandable info for a complicated topic.